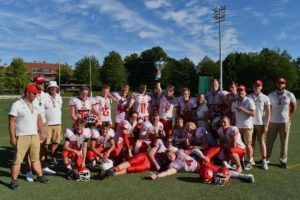 This years 2017 silver medal winning Oslo Vikings U 17 program is well represented in the United States this coming Fall. Four players have chosen to head abroad with exchange programs. These young men are now enrolled in High schools across the United states. 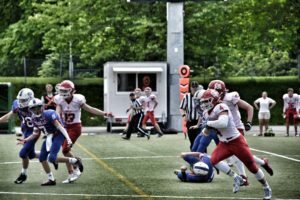 The Oslo Vikings have a long lasting tradition of sending their players abroad to Canada or the United states to try and take their football skills to the next level. The First player highlighted is Wide receiver Filip Rognerud. Filip is currently attending Union Grove High school in Georgia. Over the past 4 years, Filip has been apart of the Oslo Vikings youth program. He started with the U 15 program and just finished his final season with the U 17 program this past Spring. He is one of the brightest young talents the Vikings have seen in many years at the Wide Receiver position! WR #13 Filip Rognerud on a catch and run. Our next player is also one who hase been in this program since his first year at U 15. He has come up the ranks and before he departed for the States he was training with the Oslo Vikings Senior program at the age of 17. Magnus Meyer is a very athletic duel threat player who play on all three sides of the ball. He is now focusing on playing Linebacker and Kicker while he is states side. Magnus is attending Sandre Day O`connor high school in San Antonio Texas. This Third players final U 17 season was cut short due to an ankle injury early on in the season. 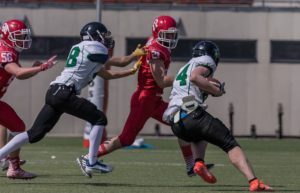 Aleksander A. Thomas is a very versatile player who was focusing on playing Running back in his final U 17 season. The team had very high expectations for him as he is an amazing young athlete. Moving forward, Aleksander is going to be focusing on playing Defensive back for Napoleon High school in the state of Ohio. Our Fourth and final player is Fridjof Alexander Lorentzen. Fridjof, or what his friends call him “Fridge” is a very exciting young player in the Vikings organization. 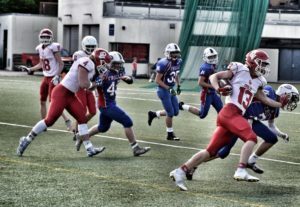 He has been with the Vikings since his U 15 days and has moved up the ranks very quickly. He has dressed and played in multiple games for the Vikings senior program over the past season. He was also one of the major contributors for the U 17 Vikings this spring. Fridjof will be attending the highly acclaimed IMG academy in Florida. He will be focusing on playing Linebacker. On behalf of the entire Oslo Vikings Organization, we would like to wish these 4 young men all the best moving forward with their academics and their football dreams. 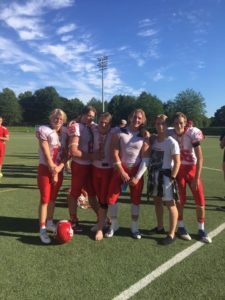 While these four are playing abroad, the rest of the Oslo Vikings U 17 and U 19 program are either playing for the Vikings U 15 team or the Bærum Vert Ironmen U 19 program. We would like to wish them both the best of luck in the upcoming Fall season! !